In 2004 I compiled a book entitled “I Remember It Well”, comprised of letters home, travel essays and extracts from my diaries covering a twenty month period, following the completion of my university studies, from 1965-1967, during which time I hitchhiked, youth-hosteled and worked my way throughout most of Western Europe. I concluded that document by noting that over the intervening years I continued to travel abroad and indicated that I was planning a five week trip to Australia in November, 2004. I did take that trip, preceded the year before by a trip to Morocco and Egypt. During these trips I began to write periodic travelogues which I e-mailed home to members of my family and a few friends, reflecting my impressions of the people and the sites that I experienced in the various places that I visited. By 2006 I had fallen into the pleasant practice of usually taking one major trip abroad every year and I began seriously and regularly to write travelogues of my day-to-day activities and impressions of the diverse locales that I had visited. In addition, during the past decade, I also traveled extensively in the United States of America taking shorter mini trips. I have retained copies of those travelogues, covering my travels abroad during the period 2006-2018, and have incorporated into them numerous photographs which I took with my point and shoot camera during those trips. 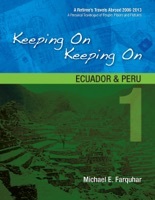 This series of books, “Keeping On Keeping On”, demonstrates that, if you are comfortably retired and in good health, there is nothing to stop you from keeping on keeping on traveling until you can no longer keep on.traveling, which is something I hope to continue to do for quite some time. I have often been asked what stands out in terms of the most memorable places I have visited. Over the years it has become increasingly clear to me that what scenes are most etched in my travel memories are the natural beauty and unspoiled wildlife in so many parts of the world. Among my favourites are Antarctica, Halong Bay in Vietnam, the Galapagos Islands in Ecuador, the Iguassu Falls in Argentina and Brazil, the desert near Wadi Rhum in Jordan, the Ngorongoro and the Serengeti National Parks in Tanzania, the Masai Mara Game Reserve in Kenya, the Joshua Tree National Park in California and the Acadia National Park in Maine, U.S.A.. Finally I get this ebook, thanks for all these Keeping On Keeping On: 1--Ecuador and Peru I can get now! Keeping On Keeping On: 1--Ecuador and Peru was the best books I ever buy. Keeping On Keeping On: 1--Ecuador and Peru did exactly what you said it does. I will recommend you to my colleagues. Keeping On Keeping On: 1--Ecuador and Peru is the most valuable books we have EVER purchased. I'd be lost without this. I am completely blown away.